Trinity School Celebrates 75 Years Of "Teaching Children What They Need For Life." Trinity School in Ellicott City is celebrating its 75th anniversary with a liturgical celebration on Saturday, October 22, 2016. The celebration, presided over by Archbishop William Lori, will be held in the school's auditorium. The land Trinity School inhabits was purchased in 1934 by the Sisters of Notre Dame de Namur. It was originally opened as a junior high and high school for girls. In 1941, the elementary school was opened and named the Julie Billiart Country Day School, after the foundress of the order. In 1972, the girls high school was closed. Trinity School grew to take over the high school building. Trinity's oldest building was constructed in the early 1900's and its newest building, St. Julie Hall, the middle school, was completed in 2002. The mission and philosophy of the Sisters of Notre Dame de Namur is still fundamental in the Trinity School of today. Trinity offers a strong academic curriculum with expanding and enriching programs in all disciplines, creating an environment where children learn to love learning. The school fosters a positive self-image in its students and provides skills and opportunities for leadership. Decision-making skills and accepting responsibility for one's actions are integral to a Trinity experience. Trinity is committed to nurturing self-respect, self-discipline, and self-direction in each student. One of the cornerstones of a Trinity education is creating a stimulating and caring environment that is conducive to learning both in and out of the classroom. Trinity encourages students to participate in programs and projects to help the less fortunate, including regular food and supply drives for local food pantries, bingo with the residents of St. Martin's Home and even helping those within the Trinity community that have fallen on difficult times. Not only are students encouraged to participate, but families as well, creating a strong and caring community. Trinity is steeped in tradition and also administers programs that foster the growth and development of the entire family. There are a multitude of activities that offer parents the opportunity to join the students, such as the annual Turtle Derby, the Fall Festival, and the Trinity Trot. Around the campus daily, you can see parents volunteering in many different capacities. At the helm of Trinity is Sister Catherine Phelps, a Sister of Notre Dame de Namur. She has provided leadership to the Trinity School community for over 45 years. She has worked with her staff to develop an educational program that encourages students to recognize and accept the uniqueness of each person. "I know that I am in a position where I can create an environment that really makes children happy and helps them to thrive," Sr. Catherine states. "I also want to have that same environment for my teachers where they can grow professionally and spiritually." Trinity has twice been named a United States Department of Education Blue Ribbon School. The school has earned many other awards such as the Maryland State Green School Award and the several Healthy Howard Innovative Awards. 39 high school scholarships were earned by the class of 2016. 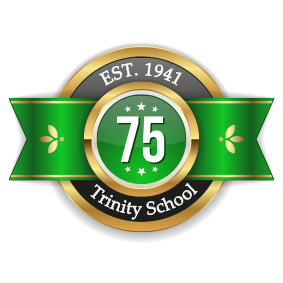 The Liturgical celebration of Trinity's 75th year on Saturday, October 22 will be held in the school's auditorium at 4:00pm and will be followed by light refreshments. Trinity welcomes all to hear Archbishop Lori and to join in the festivities.